Spread Betting Beginner trades with ETX Capital. For tight spreads, safety of client funds and low margin requirements. Moving averages provide us with one of the simplest ways to develop a spread betting strategy. There are several ways to spread bet using moving averages, you can buy or sell when price crosses a moving average or you can buy or sell when two or three moving averages cross each other. The spread betting strategy below details a moving average crossover strategy using the 50 day and 200 day simple moving averages. Some other good combinations are 21 day and 50 day. The important thing to remember is you want to have one quick moving average and one slower moving average. Buy and sell signals are generated when the quick moving average crosses the slower moving average. Disclaimer: I am publishing this strategy for educational purposes only. I accept no responsibility for loss incurred by any person or corporate body acting or refraining to act as a result of reading the following material. Below we have a simple moving average cross over strategy. This strategy does exactly what it says on the tin. We take the cross over in one direction as a buy signal and a cross over in the other direction as a sell signal. We are going to use the 50 day simple moving average and the 200 day simple moving average for this strategy. 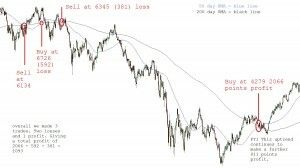 A buy or sell signal will be generated when the 50 day SMA crosses the 200 day SMA. There is no predetermined length of time for this trade. We enter the trade when the moving averages cross in one direction and we exit when they cross in the opposite direction. It’s that simple. 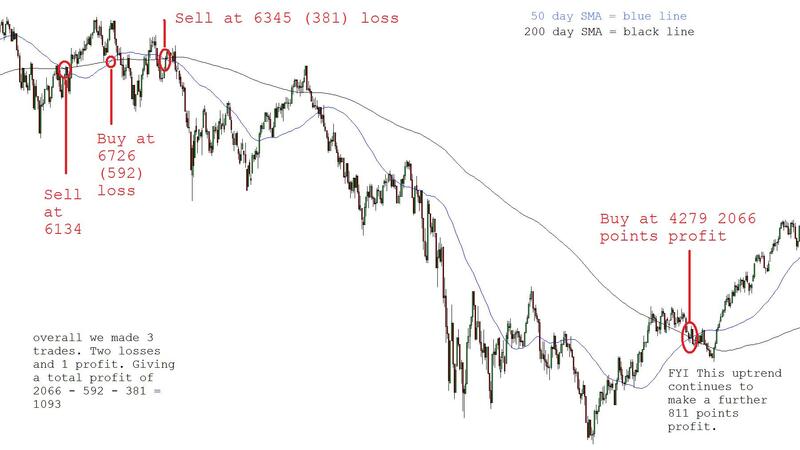 We receive a buy signal when the 50 day moving average crosses upwards through the 200 day moving average. This is also know, in technical analysis, as a ‘Golden Cross’. We receive a sell signal when the 50 day moving average crosses downwards through the 200 day moving average. This is also know, in technical analysis, as the ‘Death Cross’. Since our exit signal will come from the crossing of the moving averages we really have no need for a stop. However it’s always best to trade with a stop to help limit the damage should the worst happen. Therefore we will add a precautionary stop at the high or low of the last 200 days depending on if we are long or short. I always try to stick to only risking 1% of total funds per trade. Now this is tricky with this kind of strategy. The fact the we don’t know the exact price we will exit the trade should things not work out means that we cannot calculate our position size based on % funds to risk. It also means that we cannot accurately place our initial stop loss. Therefore we have to monitor the trade at the end of each day and either manually exit or place an order to exit the trade. In order to calculate a position size I use the initial stop placement as a guide and calculate a position size based on this stop position. It is not 100% accurate but it is good enough. The stop loss will be trailed at the low of the last 200 days for long positions and at the high of the last 200 days for short positions. Interestingly enough an exit signal is also a signal for a new trade. This is where you will have to potentially use some judgement. If you have just ridden a nice long trend it could be a good time to take some profits and look for other instruments to trade. At the end of a nice long trend instruments can go sideways and you may find you get a string of losses waiting for the next trend to come along. That said by not taking the trade you could potentially miss out on a nice big trend. Unfortunately it’s a catch 22 situation. As with every aspect of trading you take your chances and hope for the best. There is no such thing as a ‘Sure thing’ in trading. The following image is an example of this strategy in action. The image is of the FTSE 100 between July 2007 to October 2009. If you don’t believe me check it out in proRealTime or any other charting provider. You will need to click on the image to see it full size. As the image clearly shows it’s possible to make good gains with this kind of spread betting strategy. The important thing to remember is you must take every trade and it could work out that you get all your losses at once.